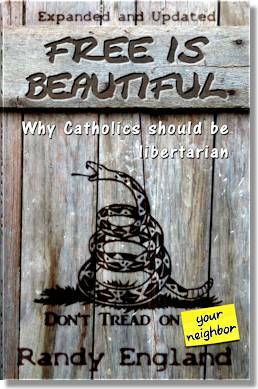 Free is Beautiful by Randy England uses the scriptures, the writings of the Saints and the Catechism to show why Catholicism is essentially libertarian. The golden rule teaches that we must not do to another what we would not want done to ourselves. Don’t cheat. Don’t steal. Don’t hit. Don’t harm others. Live and let live. Mind your own business. Libertarians call this the non-aggression principle. Centuries ago, St. Thomas Aquinas and St. Augustine recognized the futility and evil in trying to force people to be virtuous. They taught that government should limit itself to keeping the peace by protecting people’s lives and property. The modern state knows no such limits. It is time to consider libertarianism, the most just system in a fallen world and the only political philosophy that takes human dignity and free will seriously. Randy England is a writer, former prosecutor and criminal defense lawyer. He serves on the board of directors of the Freedom Center of Missouri. His other books are Unicorn in the Sanctuary (Tan Books) and The Last Fisherman: A novel of the last Pope, the anti-christ and the end of the age.